In response to persistently low use of contraception and high rates of early and rapid repeat childbearing among young married women, there is a growing call to address the drivers of low contraceptive use and to increase young married couples' access to contraception.7–9 Doing so would address critical unmet need for family planning and contribute to achievement of national and global goals and priorities, such as Family Planning 2020 (FP2020) and the Sustainable Development Goals.10,11 Some efforts have been made to increase contraceptive use among married adolescents and youth and to prevent rapid repeat pregnancies, and recent papers have synthesized the primary strategies used in these programs.7,8,12 However, there remains little published evidence from low- and middle-income countries to inform critical program design decisions related to intervention intensity and duration, effective combinations of interventions, and scale up. This makes it critical to learn from the few rigorously documented and evaluated projects that have worked with married young women and their partners to address the social and behavioral constraints to contraceptive use. The Promoting Change in Reproductive Behavior of Adolescents (PRACHAR) Project, implemented in Bihar, India, has amassed a wealth of monitoring and evaluation data on its interventions with young married couples, much of which is unpublished. By synthesizing these data and implementation experiences from more than a decade of PRACHAR implementation, this article seeks to contribute to the growing body of evidence around behavior change approaches for contraceptive use by married youth. This article seeks to contribute to the growing body of evidence around behavior change approaches for contraceptive use by married youth. The PRACHAR Project was designed and led by Pathfinder International and implemented in Bihar, India, from 2001 through 2012. At the time PRACHAR began, Bihar had few programs to address the contraceptive needs of the population, including adolescents and youth. The modern contraceptive prevalence rate was low (22%) for all women of reproductive age, with almost no contraceptive use among married adolescents aged 15–19 (1%) and young women aged 20–24 (5%).13 Bihar also had the highest prevalence of early marriage in India, with 84% of young women married by age 18.13 To address this situation, PRACHAR aimed to delay the age at first birth by delaying the age at marriage and increasing voluntary contraceptive use among young nulliparous married women, and to space second and subsequent births by at least 3 years among young married women in Bihar. PRACHAR was implemented in 3 phases with different coverage levels, intervention combinations, and durations (Figure 1 and Table). Phase I was implemented for 3 years in Nalanda, Nawada, and Patna districts of Bihar, using a comprehensive model including all the interventions described above. Phase II was implemented in 5 districts: the original 3 districts plus Gaya and Shikhpura. Phase II included different intervention arms to compare the effectiveness of the comprehensive PRACHAR model over different durations (2 and 5 years) with 3 “single intervention” models. The “single-intervention” models were: trained couples only (where young married couples were trained to provide reproductive health information), home visits only, and volunteers only (where community resource people were available for reproductive health questions and dialogue without a formal home visit or group meeting structure). All the arms in Phase II included community-level enabling environment activities. Phases I and II were implemented through local NGOs with referrals to government and private-sector service delivery sites. Phase III was implemented for 3 years in Gaya district and aimed to test a streamlined government-NGO model that had greater potential for scale up than the Phase I and II models. Government community-based health workers (Accredited Social Health Activists [ASHAs]) assumed the role of female change agents conducting home visits. Local NGOs maintained responsibility for male engagement and training unmarried adolescents. Engagement with husbands, gatekeepers, and the broader community was diminished. The Phase I, II, and III districts were chosen because they were representative of Bihar from a demographic perspective (the majority of the population was of low socioeconomic status and belonged to the Scheduled and Backward castes) and were within 2–4 hours of the city of Patna (the state capital) by car or bus. The PRACHAR Project was implemented in 3 phases between 2001 and 2012 with different coverage levels, intervention combinations, and durations. From 2014 to 15, Pathfinder International staff conducted a review of existing PRACHAR Phases I, II, and III evaluation reports, special studies, presentations, and project monitoring data to synthesize evidence related to the following research question: “What is the evidence from PRACHAR around programming to increase contraceptive use among young married women and men?”. The studies we reviewed are briefly described here, and their methodologies are described in the source files referenced. First, we reviewed reports of quasi-experimental studies conducted for each project phase, i.e. population-based surveys among young married women and men in intervention and control areas at baseline and endline.15–17 In addition, we reviewed reports of special studies conducted to further assess effectiveness of interventions. These included the Adolescent Follow-up Survey with youth in PRACHAR Phase I intervention areas who participated in adolescent trainings and other enabling environment interventions, as well as a comparable control group; a qualitative study on gender norms, attitudes, and practices related to sexual and reproductive health outcomes in PRACHAR intervention and comparison areas; a survey conducted by the Population Council to evaluate the effectiveness of Phase III in building ASHAs' capacity to offer reproductive health services; and a population-based survey conducted by the Population Council to evaluate if the reproductive health outcomes observed in PRACHAR Phases I and II were sustained among new cohorts of women 5–8 years after PRACHAR ended.18–21 We also reviewed analyses of individual-level routine project monitoring data on contraceptive uptake among young married beneficiaries. Following the review of existing PRACHAR evaluation and monitoring reports, we identified key gaps in knowledge that would be important to address for program design purposes and conducted secondary analyses of PRACHAR evaluation data to answer specific questions around effectiveness, intensity, and duration of program interventions. We generated bivariate frequency distributions and conducted multivariate logistic regressions with contraceptive use as the outcome variable and a variety of independent variables (demographic characteristics such as age, education, wealth index, and parity; exposure to PRACHAR interventions). The findings from our review and the secondary analysis were categorized according to key program learning themes as described in the Results below. Through our review of the PRACHAR evaluation studies, special studies, and our secondary analysis, we identified evidence around 4 key themes: (1) project effectiveness in achieving attitudinal and behavioral outcomes; (2) effectiveness of selected program components and the intensity required to produce effects; (3) scalability and effectiveness at scale; and (4) sustained project impact. The results of our analyses indicate that comprehensive intervention models of longer duration are most effective in increasing contraceptive use among married youth. 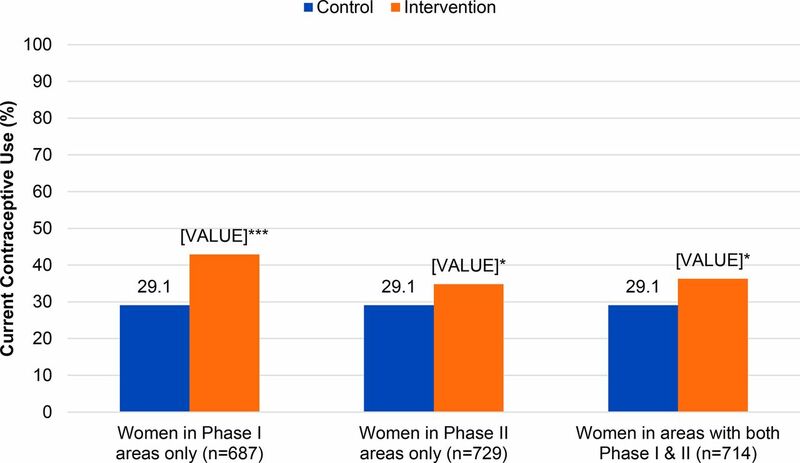 The 3-year comprehensive NGO-led PRACHAR model in Phase I, which included behavior change elements and multiple overlapping communication channels, had the greatest magnitude of effect on contraceptive use. As published in Daniel et al. (2008), the odds of current contraceptive use increased nearly 4 times as much from baseline to endline among young married women in Phase I intervention areas than among those in comparison areas (adjusted odds ratio [aOR]=3.84; P<.001, adjusted for age, education, caste, and parity) (Figure 2).15 The adjusted effect size for Phase I is larger than that of PRACHAR's 2-year “single-intervention” models in Phase II (i.e., the 2-year “home visit only” model with an aOR of 2.00, P<.01, adjusted for age, parity, education, caste, and standard of living index; the 2-year comprehensive model [not statistically significant]; and the 2-year “volunteers only” model [also not statistically significant]),16 as well as the Phase III government-NGO model of similar duration (aOR=1.34; P<.001, adjusted for age, education, and caste).17 The lack of significant effect on contraceptive use in the comprehensive 2-year model (aOR=1.30) offers suggestive evidence of a minimum duration of comprehensive interventions required to achieve effects in this context. Comprehensive intervention models of longer duration are most effective in increasing contraceptive use among married youth. Bivariate findings on current contraceptive prevalence rate from all 3 PRACHAR Phases also show the greatest baseline-endline increase in the 3-year Phase I model, from 4% to 21% in intervention areas (Figure 3).15–17 While the contraceptive prevalence rate findings from Phases I and II are not directly comparable with Phase III due to different study populations (ages 15–24 in the former vs. ages 15–34 in the latter), the relative baseline-endline increase is still greatest in the 3-year Phase I model. Phase I evidence also sheds light on the relative contributions of specific PRACHAR interventions, as well as the intervention timing and intensity required to influence contraceptive use. Home visits by NGO change agents conducting interpersonal communication were found to be effective in increasing contraceptive use among young married women when implemented in tandem with community-level activities that aimed to change attitudes and behaviors. In the Phase I comprehensive model, young married women in PRACHAR intervention areas who were exposed to home visits had 2 times higher odds of currently using contraception than those who did not receive home visits (aOR=2.30; P<.001, adjusted for education, caste, and standard of living index). Among the Phase II “single-intervention” models, the home visit model (plus service linkages and community-level interventions) had the highest magnitude of effect for current contraceptive use (aOR=2.00 as noted above; P<.01).16 No effect was seen in the other “single-intervention” 2-year models. Additionally, bivariate analyses showed that couples reached with both adolescent training and home visits in Phase I had higher rates of ever using contraception than couples reached with only one of these interventions, suggesting a multiplicative effect of these interventions. There is also some evidence of effectiveness of small-group meetings. Phase I and II data show that married women in PRACHAR intervention areas who were exposed to group meetings (and potentially other interventions as well) had 3 times higher odds of currently using contraception than those not exposed (aOR=3.16; P<.001, adjusted for education, caste, and standard of living index). Home visits by NGO change agents, when implemented in tandem with community-level activities, were found to be effective in increasing contraceptive use among young married women. PRACHAR Phase I monitoring data show that intensity and timing of home visits matter. Women reached with home visits at multiple life cycle stages (newlywed, before pregnancy, during pregnancy, and after first birth) had the highest ever use of contraception after their first birth and initiated contraception more quickly compared with women reached at fewer life cycle stages. In addition, a relationship was observed between the number of home visits and ever use of contraception among young married women, with 7 to 12 visits as the “tipping point” where more than half of contraceptive users had initiated use (Figure 5). 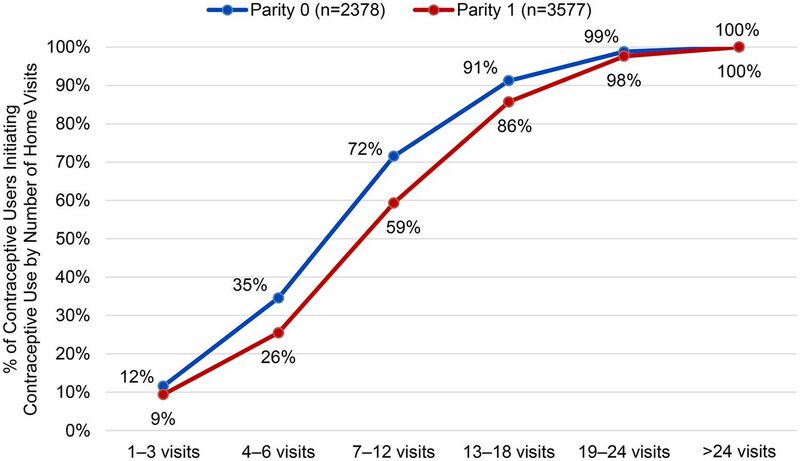 While multiple factors affect initiation of contraception, these data suggest that among young women who eventually used contraception, repeated home visits were required to stimulate contraceptive initiation. We also found that contraceptive initiation earlier in life is correlated with future contraceptive use. Results from the Adolescent Follow-up Survey show that married young women with 1 or more children (in both intervention and comparison areas) who had used contraception before their first birth had nearly 14 times higher odds of using contraception after their first birth compared with women who had not previously used contraception (aOR=13.70; P<.001).21 This further underscores the importance of reaching young married women to promote contraceptive initiation early in their reproductive life. Contraceptive initiation earlier in life is correlated with future contraceptive use. Phase I results suggest that a gender synchronized approach in which both male and female partners are engaged—both together and separately—was associated with stronger results than working with only young men or only young women. 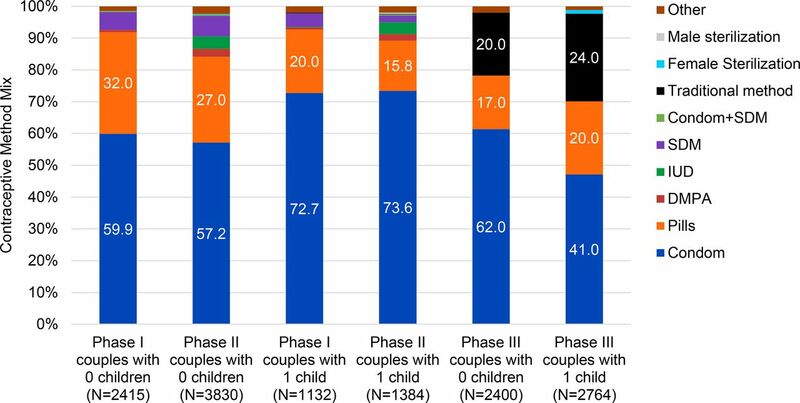 Couples in which both the woman and her partner were exposed to PRACHAR had the highest odds of contraceptive use (aOR= 3.69; P<.001), whereas couples in which only the woman was exposed to PRACHAR had lower odds of contraceptive use (aOR=1.99; P<.01), and there was no significant effect on contraceptive use for couples in which only the husband was exposed (aOR=0.87; P>.05) (Figure 6). Similarly, Phase I and II data show that couples had higher odds of contraceptive use when wives participated in decision making about contraceptive use vs. when they did not participate (aOR=1.5 for couples without children and aOR=1.2 for couples with 1 child). The PRACHAR data do not shed light on the effectiveness of the other PRACHAR intervention components. 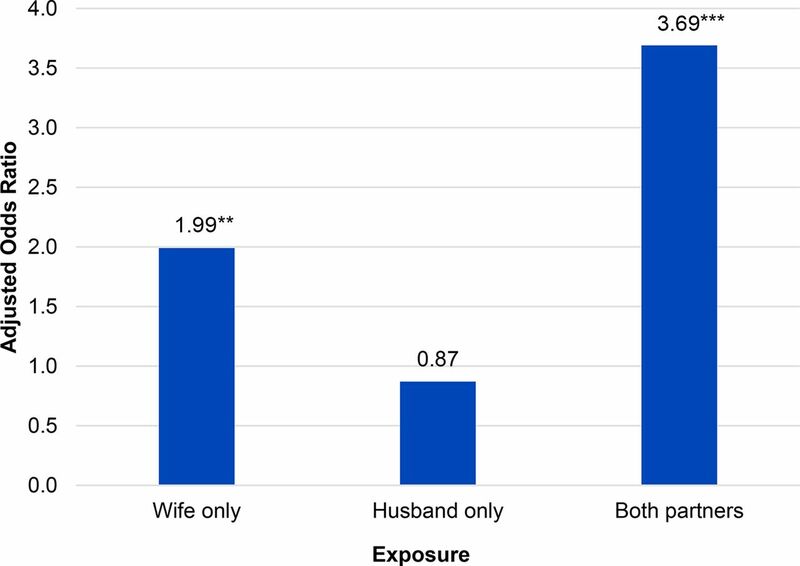 No significant associations were found between exposure to newlywed ceremonies or cultural programs and current use of contraception by young married women. The added impact of engaging mothers-in-law and other key gatekeepers could not be determined, as young married respondents were not asked if other family members besides their partner (i.e., parents, parents-in-law) participated in PRACHAR activities, and gatekeeper and community engagement to shift attitudes occurred across all Phase I and II intervention arms. As per an internal evaluation report by the Population Council, the scalable PRACHAR Phase III hybrid government-NGO model (using ASHAs instead of change agents and reducing or eliminating other activities) had significant but smaller contraceptive use gains than Phases I and II.17 From PRACHAR Phase III baseline to endline, the odds of currently using contraception increased 34% more among young married women in PRACHAR intervention areas than in comparison areas (aOR=1.34; P<.01, adjusted for age, education, and caste). Effect sizes varied by parity: aOR=1.89 among women with 1 child (P<.05), aOR=1.67 among women with more than 2 children (all P<.01), and no significant effect among women with zero or 2 children. The smaller effect sizes in Phase III may reflect several implementation factors. First, women in comparison and intervention areas had comparable rates of exposure to ASHAs (74% and 77%, respectively, in the 3 years prior to the survey). Second, among women contacted by ASHAs, only 28% of women in intervention areas and 17% of women in comparison areas reported that the ASHA discussed family planning. (For reference, 78% of women in intervention areas and 79% of women in comparison areas reported that the ASHA discussed child immunization.) Third, ASHAs had lower coverage rates for zero-parity women, which was a key target population for PRACHAR. Only 43% of zero-parity women were reached at least once in both intervention and comparison groups, compared with 78% to 86% of women of parity 1 or higher. Only 44% of zero-parity women visited by ASHAs received 13 or more visits in the past 3 years, compared with 61% to 74% of women of parity 1 or higher. Finally, Phase III also lacked significant behavior change interventions with gatekeepers such as mothers-in-law and other community influencers. The hybrid government-NGO model, while scalable, had significant but smaller contraceptive use gains than the NGO-led model. As published in Jejeebhoy et. al (2015), the current contraceptive use gains achieved in PRACHAR Phases I and II persisted several years after the interventions ended, both among those directly exposed to PRACHAR as well as those living in the intervention areas at the time of the survey but not directly exposed to PRACHAR.20 Married women aged 15–34 in areas where Phases I and/or II were implemented 4–8 years earlier had 2 times higher odds of ever using contraception (aOR=2.06) and 57% higher odds of currently using contraception (aOR=1.57) than women in comparison areas where PRACHAR was not implemented (both P<.001) (Figure 7). Bivariate findings showed the highest current contraceptive use of 43% among married women living in areas where PRACHAR Phase I was implemented (Figure 8). Sustained effects were also seen for initiation of contraceptive use immediately after marriage and after first birth among specific parity groups. Married women with zero or 1 child living in former PRACHAR Phase I areas had nearly 5 times higher odds of initiating contraceptive use within 3 months of consummating marriage than women in comparison areas (aOR=4.95; P<.05), with 4.1% of women with zero children and 5.9% of women with 1 child initiating contraception in this time frame (vs. 0% and 2.1% in comparison groups, respectively). Married women with 1 child in former Phase I areas had 3 times higher odds of initiating contraceptive use within 3 months of their first birth (aOR=3.13), with 10.2% of women with 1 child initiating contraception during this time frame (vs. 2.9% in comparison areas). Married women with 2 children in former PRACHAR Phase II areas had 61% higher odds of initiating contraception within 3 months of their first birth (aOR=1.61) than women in comparison areas (both P<.05), with 15.1% of women with 2 children initiating contraception during this time frame (vs. 9.8% in comparison areas). The contraceptive use gains achieved under the NGO-led PRACHAR model persisted several years after the interventions ended. The evidence and learning generated from a decade of PRACHAR implementation have important implications for the design of future programming both in India and in a range of other contexts that face similar challenges of early marriage, early and rapid repeat pregnancies among young married women, and inequitable social and gender norms. The evidence and learning also raise critical questions around scale up and sustainability that should be explored in future programming for married youth. PRACHAR Phase I results demonstrate that a comprehensive program with multiple reinforcing interventions tailored to specific life stages and aimed at different levels of a socioecological model can effectively increase contraceptive use among married young people in a conservative context. PRACHAR evaluations and implementation experience also demonstrate the importance of several other design features, particularly gender synchronization and the life cycle approach for adolescents and youth. When both young married women and their male partners were exposed to project interventions, contraceptive use was greater. This quantitatively demonstrates what the literature has long suggested—that changing behaviors related to contraception and fertility requires engagement of both members of the couple.22 While PRACHAR effectively engaged both members of the couple, the gender content of the intervention was somewhat limited, focusing primarily on enhancing young women's participation in household decision making. The social and behavior change interventions at the community level focused on norms related to marriage, contraception, and fertility, rather than underlying inequitable gender norms. As gender inequality is a primary driver of early marriage and early and rapid repeat childbearing among young women, future programs aiming to increase contraceptive use among young married women should more robustly address the gender inequitable attitudes, behaviors, and norms underlying contraceptive behavior and the intersectional vulnerabilities, such as poverty and lack of educational opportunities, that young married women face. When both young married women and their male partners were exposed to project interventions, contraceptive use was greater. Though Phase I and Phase III evaluations did not use the same methodology so caution should be taken in direct comparison, the smaller magnitude of effect of PRACHAR Phase III (the government-NGO hybrid model) relative to the effect size of Phase I (the full comprehensive model) raises important considerations for program design and scale up. First, the shift from NGO change agent (in Phases I and II) to ASHA (in Phase III) enhanced scalability. ASHAs are a scalable platform through which interventions can potentially reach many people and be sustained through government funding, whereas local NGOs have limited geographic reach and depend on external funding sources. However, the shift to ASHAs resulted in reduced quality and reach of interpersonal communication during home visits under Phase III. There are several possible reasons for this. Like community health workers in many other countries, ASHAs are responsible for promoting a wide range of maternal and child health care practices and are regularly tasked with additional priorities. During PRACHAR implementation, incentivization schemes that encouraged ASHAs to seek out pregnant women and refer them for institutional delivery diverted ASHAs from reaching young nulliparous women and inadvertently disincentivized discussion of family planning. Some states in India have explored incentivization of community health workers for helping couples to achieve outcomes related to delaying and spacing births, but ASHAs—like community health workers worldwide—remain a cadre with many responsibilities and competing incentives covering the gamut of maternal and child health. The PRACHAR experience under Phase III demonstrates the challenges of relying on government-supported multipurpose community health workers to conduct intensive behavior change focused on young married women, amidst their other competing priorities. The PRACHAR experience suggests that there are trade-offs for behavior change approaches when moving from a more intensive, NGO-implemented approach to an approach that may be more easily scaled but relies on overburdened government workers or systems. These trade-offs are not unique to PRACHAR and are likely to be found when seeking to scale up behavior change programs across a range of target groups and outcomes.24 Behavior change often requires moreintensive interpersonal and community-level efforts, which do not fit naturally into the mandate and scope of most government community workers or existing government systems, such as health facilities. For example, in India as in many other countries, there are no clear government workers or systems to take up interpersonal behavior change efforts with adolescents and youth and community-wide social and behavior change activities, which poses further challenges to scaling up through government-only systems. The Rashtriya Kishor Swasthya Karyakram (RKSK) program in India, launched in 2014, is the current national initiative to promote the health of adolescents and youth through interpersonal communication strategies, health services, and several other school- and community-based channels.25 However, RKSK uses unpaid youth peer educators, rather than a formal government system or cadre, as the primary implementer of the program component that aims to reach young people with interpersonal communication to catalyze behavior change. Governments, donors, and practitioners must think critically and creatively about the appropriate scale-up pathways for behavior change interventions that rely on interpersonal communication and analyze potential trade-offs between quality, impact, and scale. These considerations also suggest that practitioners could explore and rigorously evaluate methodologies for behavior change that require less intensive interpersonal and community-level interventions. The PRACHAR experience also raises important questions on potential tensions between less intensive implementation approaches that can reach more people in the context of constrained funding but may have diminished impact on intractable behaviors, and intervention models that may be more intensive but catalyze change in behaviors with long-lasting and intergenerational effects. The PRACHAR long-term studies indicate that the more intensive interventions of PRACHAR Phases I and II had sustained impacts for 4 to 8 years after the program ended. While the PRACHAR studies did not include normative measures, the sustained behavior change and corresponding attitudinal changes regarding healthy timing and spacing of pregnancies suggest that norms surrounding use of contraception and fertility among young married couples may also have shifted due to PRACHAR. While direct comparison of the sustained impact of Phases I and II with Phase III is not possible (because no long-term study has been done following Phase III), it is important to consider whether the intensity and/or quality of Phase I and II interventions might have contributed to the sustained effects observed. Would we see the same sustained effects from the less intensive ASHA-led intervention with limited community engagement, especially given that the immediate effects on contraceptive use at endline were modest (and negligible among zero-parity women)? We hypothesize that we would not. This begs the question of whether a more intensive model that creates sustained impacts after 3 years of implementation may offer better value for money than a less intensive model that reaches more people but must continue for many more years to create long-lasting effects. We thank the former Pathfinder International India staff (Rekha Masilamani, Sita Shankar, Manoj Kumar, and all the other PRACHAR Project staff) who made the PRACHAR Project possible, as well as Dr. SK Singh (Senior Advisor) and Dr. Sarda Prasad (Analyst) for conducting the secondary analysis of PRACHAR data. We also thank Dr. Shireen J. Jeejebhoy (formerly with the Population Council), Dr. Rajib Acharya (Population Council), and Dr. Neelanjana Pandey (Population Council) for conducting the PRACHAR Phase III evaluation and sustainability studies whose findings are included in this manuscript. We would also like to thank Gwyn Hainsworth (formerly with Pathfinder International, now with the Bill & Melinda Gates Foundation) for ongoing technical support throughout the PRACHAR Project and contributions to the early conceptualization and review of this paper. We also thank Lester Coutinho (formerly with the David and Lucile Packard Foundation, now with the Bill & Melinda Gates Foundation) for his steadfast support and contributions throughout the conceptualization and implementation of each PRACHAR phase. Funding: The Bill & Melinda Gates Foundation funded the Momentum Project to disseminate learnings from PRACHAR to inform contraceptive programming with married youth. The David and Lucile Packard Foundation funded all 3 phases of the PRACHAR Project and the program learning grant to synthesize lessons learned from PRACHAR. UNFPA funded a portion of PRACHAR Phase III implementation. World Health Organization (WHO); United Nations Population Fund (UNFPA). Married Adolescents: No Place of Safety. Geneva: WHO; 2006. http://www.who.int/maternal_child_adolescent/documents/9241593776/en/. Accessed May 23, 2018.
. Adding It Up: Costs and Benefits of Meeting the Contraceptive Needs of Adolescents. Washington, DC: Guttmacher Institute; 2016. https://www.guttmacher.org/fact-sheet/adding-it-meeting-contraceptive-needs-of-adolescents. Accessed May 23, 2018. United Nations Population Fund (UNFPA). Girlhood, Not Motherhood: Preventing Adolescent Pregnancy. New York: UNFPA; 2015. https://www.unfpa.org/publications/girlhood-not-motherhood. Accessed May 23, 2018.
. Unmet Need for Family Planning Among Young Women: Levels and Trends. DHS Comparative Reports No. 34. Rockville, MD: ICF International; 2014. https://dhsprogram.com/publications/publication-cr34-comparative-reports.cfm. Accessed May 23, 2018. The Family Planning Summit for Safer, Healthier and Empowered Futures. Family Planning 2020 (FP2020) website. http://ec2-54-210-230-186.compute-1.amazonaws.com/wp-content/uploads/2017/07/FP2020_Summit_Outcome_Document_V9_CLEAN-wozim2.pdf.
. Literature Review: Reaching Young First-Time Parents for the Healthy Spacing of Second and Subsequent Pregnancies. Washington, DC: Evidence to Action; 2014. https://www.e2aproject.org/publication/literature-review-reaching-young-first-time-parents-for-the-healthy-spacing-of-second-and-subsequent-pregnancies/. Accessed April 12, 2018.
International Institute for Population Sciences (IIPS); ORC Macro. National Family Health Survey (NFHS-2), 1998-1999: India. Mumbai: IIPS; 2000. https://www.dhsprogram.com/pubs/pdf/FRIND2/FRIND2.pdf. Accessed May 23, 2018. Pathfinder International. PRACHAR: Promoting Change in Reproductive Behavior in Bihar, India, Summary Report of Phase II Evaluation Findings. Watertown, MA: Pathfinder International; 2011. Population Council. Improving the Sexual and Reproductive Health of Married Women and Men: Effects of the PRACHAR-III Project. New York: Population Council; 2013. Pathfinder International. PRAGYA: Multisectoral, Gendered Approach to Improve Family Planning and Sexual and Reproductive Health for Young People: A Research Study. Watertown, MA: Pathfinder International; 2011. http://www.pathfinder.org/publications/pragya-multisectoral-gendered-approach-improve-family-planning-sexual-reproductive-health-young-people/. Accessed May 23, 2018. Population Council. Effectiveness of the PRACHAR-III Intervention in Raising the Capacity of Accredited Social Health Activists (ASHAs). New York: Population Council; 2013.
. The Effect of Reproductive Health Communication Interventions on Age at Marriage and First Birth in Rural Bihar, India: A Retrospective Study. Watertown, MA: Pathfinder International; 2012. https://www.pathfinder.org/wp-content/uploads/2016/11/The-Effect-of-Reproductive-health-Communication-Interventions-on-Age-at-Marriage-and-First-Birth-in-Rural-Bihar-India.pdf. Accessed May 23, 2018.
. Synchronizing Gender Strategies: A Cooperative Model for Improving Reproductive Health and Transforming Gender Relations. Washington, DC: Population Reference Bureau; 2010. https://assets.prb.org/igwg_media/synchronizing-gender-strategies.pdf. Accessed May 23, 2018. United Nations Population Fund (UNFPA). Women's Empowerment and Reproductive Health: Links Throughout the Life Cycle. New York: UNFPA; 2000. https://www.unfpa.org/publications/women%E2%80%99s-empowerment-and-reproductive-health. Accessed May 23, 2018.
. Revising the Script: Taking Community Mobilization to Scale for Gender Equality. Washington, DC: International Center for Research on Women and Raising Voices; 2016. http://raisingvoices.org/wp-content/uploads/2013/03/Revising-the-Script_10-26_update.pdf. Accessed May 23, 2018. Ministry of Health and Family Welfare [India]. Rashtriya Kishor Swasthya Karyakram (RKSK) Strategy Handbook. New Delhi: Ministry of Health and Family Welfare; 2014. http://4dj7dt2ychlw3310xlowzop2.wpengine.netdna-cdn.com/wp-content/uploads/2016/09/RKSK_Strategy_Handbook.pdf. Accessed May 23, 2018. Institute for Reproductive Health at Georgetown University; FHI 360. Social Norms Background Reader: A Report Developed for the Convening Meeting of the Learning Collaborative to Advance Research and Practice on Normative Change for Adolescent and Sexual and Reproductive Health and Well-Being. Washington, DC: Institute for Reproductive Health, Georgetown University; 2016. http://irh.org/wp-content/uploads/2017/02/LearningCollaborative_BackgroundReader.pdf. Accessed May 23, 2018.